Matched by an occasional waft of curry powder and exuberant xylophones, an unspoken poetry persists stories above the momentous streets of Detroit’s historic Boston Edison district. The houseplants casing the windows for sunlight sprout from their respective pots engaging in a complicated tango with a warm oil portrait of the old Kanye. 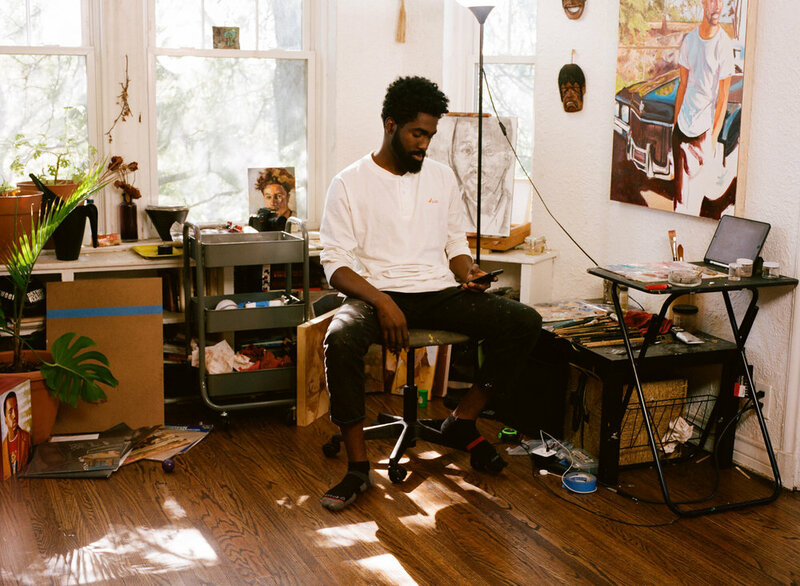 Surrounded by this airy splendor, fine artist and craftsman, Darius Baber tends a garden assortment of creations mounted about his home studio. As most creatives can attest, our work renounces a strict uniform and instead follows the sporadic pulse of its own path. This is an unmistakable fact upon descent to Darius’s living room where extensions of his mind shuffle from exposed pages in sketchbooks to canvases; even making cameos within the periodic freestyles we spit over loud and timely instrumentals playing from a nearby speaker. “I just have to create things,” explains the 29-year-old visual artist as he works on assembling a cradled hardboard panel in the center of his studio. This calling to create has carried Darius to a level of comfortability when expressing himself. It especially comes in handy when painting portraits of brown bodies immersed in colors so vivid they jump from fragrant landscapes to some of the most intimate glances within our own homes. 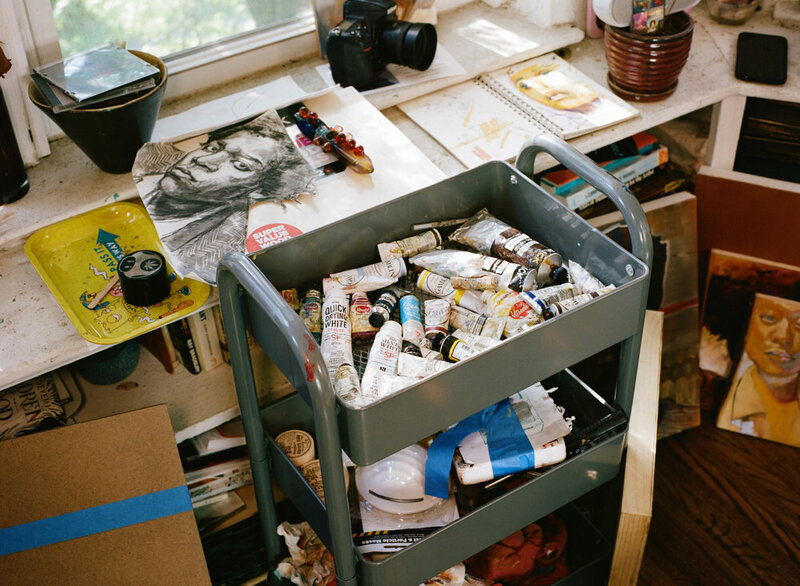 “I want to always include portraiture in my work,” He tells me. “But I really want focus on conveying deeper moods while remaining as free as possible.” To this day his most notable pieces act as symphonic introductions to what he prefers to capture most: natural beauty in harmonious existence with the environment that nurtures it. 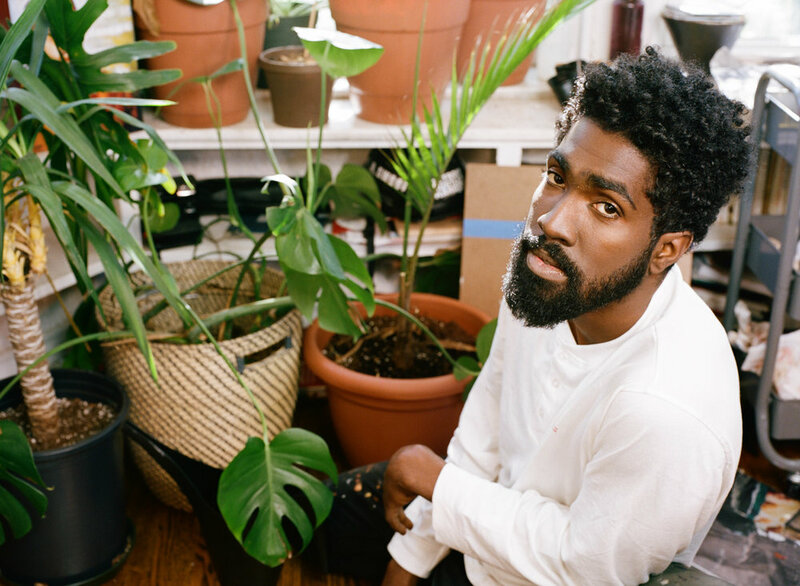 Where most would confess to solely wanting fame and admiration, Darius recalls a time when all he could ask of his artwork was to provide sustainability and community. “It takes time,” he reminds me, which explains why I found him digging at these exact intersections a year ago. 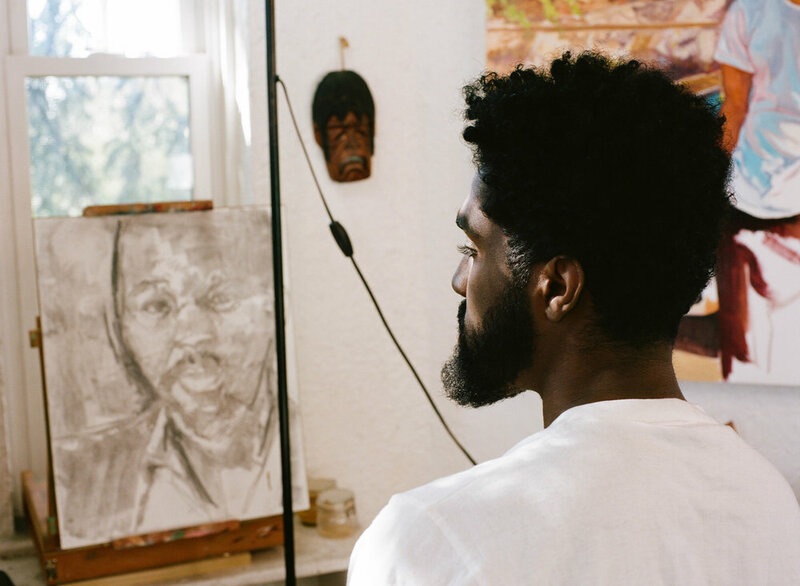 Like those before him, Darius started by building a foundation by way of creating meaningful work and networking at the crossroads of his livelihood and artistry. This platform he has built feet into the air from this humble place below has, in turn, granted him a site to stand upon in confidence. As it grows taller he selflessly welcomes creative peers and teachers alike to join him and learn from their own will to create. I’ve come to recognize then remember Darius’s work as a visual lyric of the brown, balmy, and boisterous bodies I’ve had the pleasure of brushing elbows with within this city. From his impact as an artist, mentor, and dear friend I’ve learned a slew of lessons, but what resonates most is that my relationship with creation is solely mine. 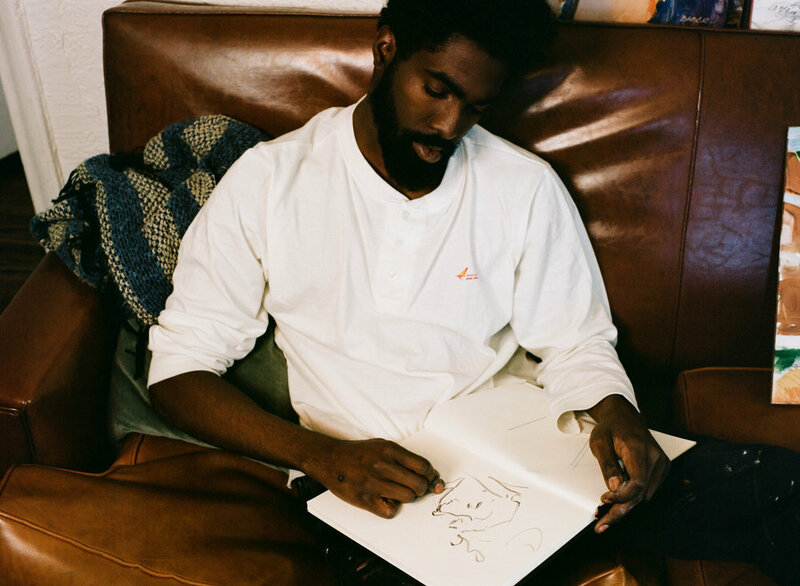 Creativity knows no bounds as Darius believes it is in his best interest as an artist to create any and all things that are conducive to expressing his most inner and centered self. You can find more of Darius’s content on instagram @dariusbaberartist.